The LAKE HOUSE on Ridge Road at Clear Lake is a beautiful Post and Beam 4 bedroom plus bunkie home with soaring pine interiors, two storey fieldstone fireplace and walls of windows facing clean, serene Clear Lake. I am happy to answer any specific questions about the property and the amenities. Click on "CONTACT OWNER" to send me a message. The property is treed and lightly sloping with massive Muskoka rock outcroppings. There is parking for 5 cars in the CARPORT and circular drive. Granite steps lead from the drive to a charming one room BUNKIE and entrance to the LAKE HOUSE. The BUNKIE is a one bedroom cabin with antique iron bed and Cathedral Ceiling with fan. It's casement window affords the most wonderful lake view and thrown open, the gentle breezes and sounds of water. It is a few steps to the POWDER ROOM inside the front door of the LAKE HOUSE. Inside, the spacious entrance HALL has a closet, two- piece POWDER ROOM and LAUNDRY/UTILITY room with beer fridge, pantry and washer and dryer. A pine and maple STAIRCASE leads to the second floor. On the main floor the ceilings soar to two storeys in a great open expanse of living, dining and kitchen. The lake side of the house is all windows with water views throughout. The LIVING ROOM is furnished with Persian carpet and white slipcovered soft seating including a sofa bed for extra overnight guests. The massive stone wood-burning FIREPLACE rises to the peak of the cathedral ceiling. Doors in the living room lead to a fully-screened MUSKOKA ROOM with slate floor, furnished with wicker and collectibles. The views to the mossy property and the lake make this the perfect spot for an afternoon snooze on the chaise. A 72" circular DINING table seats 10 or more and an additional smaller table adds more seating. An antique cherry island divides the kitchen from dining. The KITCHEN is equipped with a Garland commercial GAS range and warming hood, stainless SUBZERO refrigerator, Kitchenaid dishwasher and microwave along with drawers of cookware and tableware for entertaining. A wall of windows above the sink and prep counter makes working in the kitchen seem like no work at all. An antique English pine sideboard provides ample storage and doubles as a great serving space. The MASTER BEDROOM with king bed and big antique dresser is situated on the main floor with three windows and a set of French doors opening to the MUSKOKA ROOM. A four piece bathroom with pine vanity and marble counter is off the MASTER. The bathroom can also be accessed from the SECOND BEDROOM next door which has a queen size iron bed and antique dresser. Rear views from the main floor bedrooms are all green with moss and rocks. Up the main STAIRCASE is a large open loft area with maple floors and views to the lake and up the hill towards Ridge Road. The loft has a full size slate billiard table, soft seating, library shelves and games. At each end of the open loft are large QUEEN BEDROOMS. One QUEEN BEDROOM is decorated in greys and whites with a silver iron bed, pine armoire, slipper chair, a baby change table, child size bed plus a collapsible pack n' play bed. On the opposite side of the loft is a SECOND QUEEN BEDROOM decorated in reds and yellows with Persian carpet and antique tables. Both bedrooms have two large windows with blackout blinds, ceiling fans, large closets and soaring cathedral ceilings. The spacious four piece SECOND FLOOR BATHROOM has a separate shower, a pine vanity with marble top and the best restored antique claw foot tub you will ever soak in! Walkouts from the living room and MUSKOKA ROOM lead to a deck which stretches the full length of the house. It is furnished with outdoor wicker loveseats and chairs as well as an iron dining umbrella table, chairs and lounges. The DECK has three wooden gates to close it off from the steps to the water making a giant playpen for toddlers and babies. 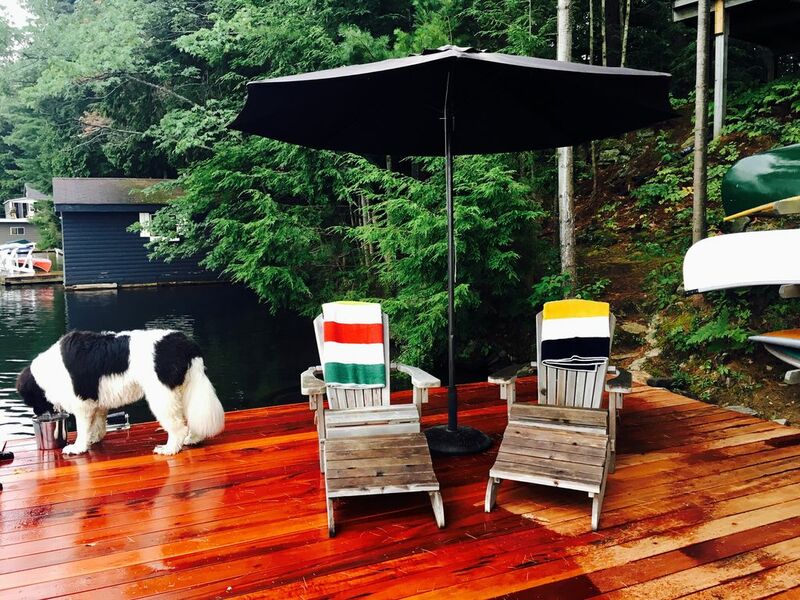 Wood and stone steps lead to the DOCK, past the swinging hammock chair The DOCK has many separate seating spots from "early morning sunrise chairs" to expansive areas with lounges and more Muskoka Chairs and even room for a kiddie pool. The WATER DEPTH slopes steeply from 18 inches at the shoreline, to 25 feet off the end of the dock. In addition there is a SWIM DOCK with chairs anchored a short swim from the Main dock. Included at the DOCK are two canoes, two standup paddle boards and a paddle boat. Our 19 foot inboard power boat is not included in the rental fee. The property and the house are beautiful, but CLEAR LAKE is the star of the show! Only 1 1/4 miles long and less than a mile wide, it sits above all other lakes in this Muskoka region and has the cleanest clearest water. Many cottagers have been on the lake a century or more but it remains a hidden gem, tucked off Southwood Road. The lake abounds with canoers and kayakers and kids flying on tubes behind boats, but the overall feeling is one of peace, serenity and pure joy. At night, when the sky is clear, the stars are spectacular. Please see the link below for Torrance Barrens Dark Sky Retreat which is only a few kilometers up Southwood Road. We see the same amazing sky! We looked for many years for the perfect cottage property for our family to congregate even when spread far and wide. We found it here on CLEAR LAKE! We hope the LAKE HOUSE gives you and your family and friends the same pleasure that it gives to us! For any further questions, click on "CONTACT OWNER" below booking button. Pillows, blankets and quilts provided for all beds listed. Beautiful open concept with wall of windows above sink/prep area, Chef's Delight! Garland Gas Range, Subzero Fridge, antique sideboard and island, cathedral beamed ceiling. Please note our property right next door at 1073 Ridge Road is also available for rent. The OAK, ACORN AND SEEDLING is a lovely older traditional Muskoka three-cottage compound with dock, boathouse and 100+ feet of lake frontage. Together they are perfect for a large family gathering. See VRBO listing 806610 for details. Our group of seven had a fantastic time at the beautiful Lake House. Gorgeous views from the house, the deck and down on the dock. Clear Lake is a perfect spot for swimming, boating and relaxing. The owner was great to deal with and we highly recommend this property. So great to know you had a good time at our favourite spot! Thank you for the kind words! The LAKE HOUSE is located on Ridge Road on Clear Lake in Torrance Ontario, Township of Muskoka Lakes, just off Hwy 169 between Gravnehurst and Bala. It is a short walk of 10 minutes to Torrance Mercantile for the morning paper and milk and bread, or a gourmet pizza at PIE. Bala is approximately 8km up the road and has a grocery, LCBO, Beer Store, the Cottage Butcher, Don's Bakery and many charming shops and restaurants. Another 25 km and you are in Port Carling home to the famous "Locks" and more fine dining, galleries and gift shops. Gravenhurst approximately 25 km south on Hwy 169 has a quaint main street complete with Opera House, toy store, breweries, restaurants, great coffee along with all the large store shopping from Sobeys amd Canadian Tire to Giant Tiger and Dollarama. See the link at the end of the listing for "things to do" in and around our beautiful neck of the woods! THE LAKE HOUSE changeover days for weekly rental are Fridays. Guests take occupancy at 3:00 pm Friday and must vacate the property by 11:00 am Friday to allow for changeover.